Meet the legalization-loving, Iraq-War-hating Californian who’s become a guru to the state sovereignty movement. This February, around 300 conservative activists and candidates gathered at the Atlanta airport Hilton to celebrate the Tenth Amendment, the oft-overlooked constitutional provision that’s become the philosophical underpinning of opposition to everything—from bank bailouts to federal gun laws to the new health care bill. Among the speakers were the author of The South Was Right; a man who’d done time for evading taxes while running a gold and silver “bank”; and Roy Moore, the former Alabama Supreme Court justice who lost his robes after refusing to remove a giant Ten Commandments from his courthouse. In 2007, with some money from a customer service job (he prefers not to say where he works), Boldin launched the Tenth Amendment Center’s website. Though the Constitution provided many tools for battling the Bush administration’s overreach—the Eighth Amendment bans torture, for instance—Boldin saw the Tenth as the ultimate check on federal power, all in a single line: “The powers not delegated to the United States by the Constitution, nor prohibited by it to the States, are reserved to the States, respectively, or to the people.” In that terse passage, Boldin saw the legal and philosophical basis for challenging a raft of executive excesses. The Tenth has also caught on with Tea Partiers and others seeking a one-size-fits-all way to snub federal authority. In April, House minority leader John Boehner (R-Ohio) commended Arizona’s new anti-immigration law, citing Arizonans’ “right under the Tenth Amendment to write their own laws.” Sen. Jim DeMint (R-S.C.) has said that under the Tenth, state governors could roll back health care reform. Click for larger versionBut in early 2009, Boldin was nearly alone in saying that states should nullify—essentially ignore—any future health care bill, which he sees as yet another example of federal thuggery (Boldin is uninsured). Now that 11 states have tried to do just that (see “Separation Anxiety“), Boldin has become the go-to guy for pithy quotes about nullification. “It seems like we have two Constitutions, Madison and Jefferson’s and Obama and Biden’s,” he told a Christian magazine. Boldin then told a rollicking story about Roscoe Filburn, a Depression-era farmer who defied a federal order to cut wheat production by planting 12 acres for his personal use. The government ordered Filburn to destroy his crops and pay a fine; the Supreme Court upheld the decision, ruling that the feds were within their authority to regulate interstate commerce. He then spoke of a modern-day Filburn, Angel Raich, a California woman with a brain tumor whose private medicinal pot garden was destroyed by federal agents. The Supreme Court had ruled against her, invoking Filburn. “Whether it’s marijuana, gay marriage, health care, the size of your toilet, this is beyond absurd,” Boldin bellowed. “We demand adherence to the Constitution, every time, every issue, no excuses, no exceptions!” The crowd went wild. 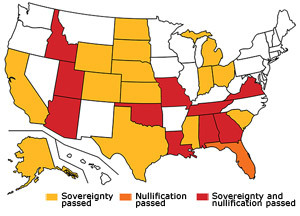 Though Boldin is adamant that “nullification is not secession,” his interpretation of the Tenth puts him in the same camp as those who have used states’ rights to justify segregation and armed resistance. He’s annoyed by that line of argument, which he says he often hears from liberals. “There’s no more racist entity in the world than the federal government, which has killed millions of brown-skinned people around the world!” he exclaims.